Coveleski signed his first professional contract in 1909 with the minor league Lancaster Red Roses, a club affiliated with the Tri-State League. Originally reluctant to sign for the club, he only agreed to do so if his older brother John also joined; at that he anglicized his name, changing it to Coveleskie, which it would remain throughout his professional career. During his first trip to Lancaster, he recalled that it was "the first time I ever rode on a train," and he added that he "was too shy to eat in the hotel with the rest of the team". In 272 innings of work his first season, Coveleski had a 23–11 win-loss record with an earned run average of 1.95. He pitched two more seasons for Lancaster, earning a record of 53–38 in 109 appearances through three seasons. ^ a b c Kashatus, pp. 9–10. ^ a b c d e f g h i j k l m n o p q r s t Levitt, Dan. "Stan Coveleski". The Baseball Biography Project. Society for American Baseball Research. Retrieved April 1, 2012. ^ "Three Coveleski Boys Sign". ^ "Harry Coveleski Statistics and History". Baseball-Reference. Sports Reference, LLC. Retrieved April 9, 2012. ^ a b Kashatus, p. 9. ^ a b c Kashatus, p. 10. ^ a b Kashatus, p. 44. ^ a b c d "Stan Coveleski Minor League Statistics & History". Baseball-Reference. Sports Reference, LLC. Retrieved April 9, 2012. ^ a b c d e f g h i j k l m n o p q "Stan Coveleski Statistics and History". Baseball-Reference. Sports Reference, LLC. Retrieved April 9, 2012. ^ a b c d Kashatus, p. 86. ^ Bang, Ed (May 20, 1916). "Cleveland Still On Top" (PDF). ^ Nickerson, Herman (January 13, 1917). "Affairs in American League" (PDF). Sporting Life. p. 6. ^ Bang, Ed (January 27, 1917). "Cleveland Better Prepared in Case of a Player Strike Than Any Other Club" (PDF). Sporting Life. p. 7. ^ "The 1917 Cleveland Indians Game Log". ^ "Cleveland Wins 19-Inning Game". ^ a b c "1920 World Series". Baseball-Reference. Sports Reference, LLC. Retrieved May 27, 2012. ^ "25,000 Crowd Polo Grounds For The Game". ^ "Coveleskie Proves Too Much". ^ "Coveleskie Gains Another Triumph". 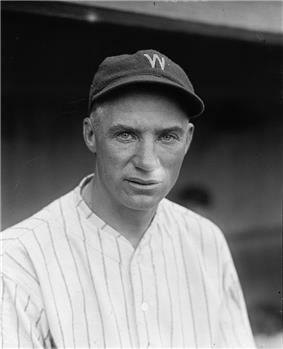 ^ a b "Stan Coveleski 1923 Pitching Gamelogs". Baseball-Reference. Sports Reference, LLC. Retrieved June 7, 2012. 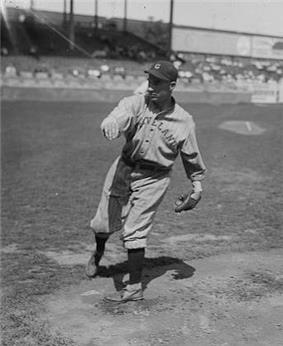 ^ "Stan Coveleski 1924 Pitching Gamelogs". Baseball-Reference. Sports Reference, LLC. Retrieved June 7, 2012. ^ "Senators and Yankees Favored to Cop Pennant". ^ "Tight race in the Majors". ^ "Senators and Pirates Are Evenly Matched for Series". ^ "Cards Lead League Beat Pirates Two". ^ a b c Kashatus, p. 88. ^ "Yankees Sign Zachary and Release Covey". ^ a b Kashatus, p. 126. ^ "Stan Coveleski". National Polish-American Hall of Fame. Retrieved June 11, 2012. Kashatus, William C. (2002). Diamonds in the Coalfields: 21 Remarkable Baseball Players, Managers, and Umpires from Northeast Pennsylvania. Macht, Norman Lee (2007). 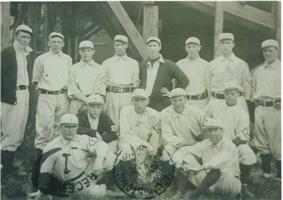 Connie Mack and the Early Years of Baseball. Schneider, Russell (2004). The Cleveland Indians Encyclopedia. Sowell, Mike (1989). The Pitch That Killed. Thomas, Henry W. (1995). Walter Johnson: Baseball's Big Train.